What Does A Bucket List Look Like For A 5-Year-Old? Today I did something I had never before even considered; I contemplated the activities that might comprise a bucket list for my 5-year-old daughter. If that sounds morbid, then … well, it should. 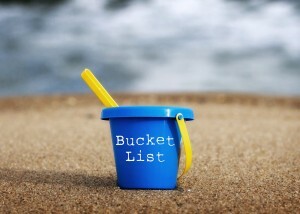 “Bucket list” is a term that has absolutely no right occupying space in the same sentence as “5-year-old.” Documenting an inventory of the experiences one longs to complete before inhaling their final breath is an activity that should be reserved for empty nesters, or for those living out their golden years in lush retirement communities, or at the very least, for people who have achieved some of the basic milestones on the path to adulthood —attending a high school prom, passing their driver’s test, getting their braces off. It should never, ever be something mapped out for a kid like my daughter’s friend, Parker. And yet that is exactly what his parents have been forced to deliberate. Parker, who will probably lose his life before he even loses his first tooth, has terminal brain cancer. Rather than think about signing their son up for Little League or removing the training wheels from his bike or registering for summer swim lessons, his mom and dad are instead left to plot his final activities, to essentially carve a lifetime of memories into the next several months, while simultaneously caring for their sick child. Just a couple of weeks ago, I imagine their mornings probably unfolded much like my own did today. A bucket list was the farthest thing from my mind when I woke up. Instead, I was lamenting having to drag my body through the daybreak routine following another night of disjointed sleep, compliments of my daughter’s incessant cough. I was focused on reuniting the lost mitten we hadn’t seen in days with the matching counterpart at the bottom of her backpack. I was busy checking off boxes on my mental to-do list: schedule doctor’s appointment, fill out class Valentine’s Day cards, pick up children’s cough suppressant. To be honest, I was grumbling a bit in my head about the drudgery of deeds that must take place to ensure we make it out the door by 7:35 a.m. — from taming Aubrey’s unruly tresses to wiping the last sticky traces of oatmeal from her face. And so, utterly safeguarded by the unappreciated chaos of another regular day of parenting, I never once paused to consider — or be thankful for — the fact that we didn’t have to tackle the task of composing a damn bucket list. It is a luxury I promise I won’t take for granted tomorrow morning. I was aware that Parker hadn’t been at school lately. Not only was his absence repeatedly brought to my attention by Aubrey (who shares with me every intricate detail of her three-hour transitional kindergarten day, from which student was bestowed the coveted title of line leader to who took a tumble on the playground), but I had noticed he had been missing from the line. Beginning on the first day of school, Miss Fiscus had assigned each student a number, then arranged the class into a pair of perfectly choreographed rows, which the kids had learned to fall into with astonishing precision at the blare of the morning bell. Aubrey is number 11 in the first line, and Parker, number 13, occupies the last slot. But for days I’d watched Logan, number 12, form the caboose. Yet Parker’s attendance record didn’t raise any cause for alarm, because Miss Fiscus’ class has been a revolving Petri dish of bacterial and viral infections over the past couple of months. If a kid isn’t absent— bed ridden with a fever or the dreaded stomach bug — then he or she is at the very least coughing, sneezing or sniffling for all to share. Mine included, who has been to the doctor three times since Christmas. So when Aubrey informed me on the drive home yesterday that “Parker still wasn’t at school,” I thought nothing of it. I nonchalantly remarked that he probably had the flu or bronchitis or an ear infection. I promised that her buddy would be back soon. At drop off this morning, I learned the reality: two weeks ago, Parker went home with a fever and a droopy eye, stumbling a bit. And two days after that, his parents were smacked with a most unwelcome inauguration to Diffuse Intrinsic Pontine Glioma, or DIPG. It’s a cancer that resides in the brain stem. The kind that is inoperable. The kind that is virtually untreatable. The kind that makes it unlikely Parker will be here to blow out six candles on his next birthday cake. He’s a baby, for God’s sake! He and Aubrey and their 25 classmates aren’t even in real kindergarten yet; it’s transitional, they are still preparing for kindergarten. And now, while the rest of the class will go on to learn sight words and complete reading logs and place shiny stars next to all of their sparkly 5-year-old accomplishments, Parker will be preparing to … die. I can’t imagine. And so I just cry. I cry all morning, blowing my nose and mopping my eyes through an entire box of Kleenex; a deep, penetrating, ugly cry that emanates from the pit of my stomach, a howl that eclipses my womb. I tell myself I have to get it together, because I have to pick up Aubrey from school, and none of the kids are aware that Parker has anything more serious than a case of the sniffles. But I can’t stop sobbing, heaving. I cry for Parker, for the thousands of seemingly trivial rights of passage that he won’t have the opportunity to traipse — riding a skateboard, hitting a home run, holding a girl’s hand. I cry for Aubrey, and for all of her classmates, who are just too damn young to understand why their first line now ends with number 12, but the second one begins with number 14. Little boys and girls who shouldn’t have to wonder why Parker won’t be moving on to real kindergarten with them next year, why he will no longer be at school to play tag at recess, or check out a library book, or take his turn as line leader. I cry for Parker’s 2-year-old sister, who won’t have the privilege of growing up under the protective shield of a big brother. I cry for Parker’s parents, for whom every single fiber of my body aches. Just ordinary people who should never, ever have to consider the unthinkable task of assembling a bucket list for their 5-year-old. Loving parents who one day were watching their son grow up … and the next day are instead watching him die. I cry because as unfathomable as the pain must be for Parker’s family, it is, at the same time, all too easy to imagine that it could be me and my husband. It could be our child. It could be any of us parents whose life is swiftly and utterly derailed by such a random, devastating tragedy. I see all of those updates in my Facebook feed, friends sharing posts accompanied by photos of children draped in hospital gowns, their bald heads masking the innocence of childhood. I never know what kind of cancer they have, or what their prognosis is, or what type of treatment they are undergoing, because I can never bring myself to read the posts. It’s just too crushing to consider what their parents are going through. My heart clenches, imagining for even a split second, what it would be like if Aubrey was the one laying in that hospital bed, tubes expelling from her body, her tussles of wavy blonde hair replaced by the shiny crown of chemo. I’ve never met any of those sick children — or any of the parents who have somehow survived that kind of grief — which made it a lot easier to just swipe by, move on to the next post in my feed, refocus my attention back to my perennial mental to-do list … and forget. Now Parker has a Facebook page. And a blog where his parents are journaling about this new, horrifying nightmare that is their life. I look closely at every photograph, taking in his every expression. Sweet little Parker, number 13, with the close cropped blond hair and the sheepish grin, a smile filled with baby teeth. I read every word of every post. I have to go back and read them a second time, because I miss some of the details through all the tears. It’s staggering how tragedy transforms our perspective, revamps our priorities, halts us dead in our tracks. My daughter’s intermittent cough, so grating yesterday, is today comforting proof of the very life and breath pulsating through her body. Yesterday’s harried search for a stray mitten today feels like a cherished privilege. Now, in the midst of my moments of impatience or frustration or fatigue— the all-too-natural byproducts of this wild ride we call parenting —I imagine I will see Parker’s face. And it will be a constant, heart wrenching reminder that however bad my day might seem, I am blessed that it didn’t involve making a bucket list for my 5-year-old child.